The Greenwich Interconnection Tunnel is a branch tunnel that splits from the Main Thames Tideway Tunnel at Chambers Wharf and goes by way of Earl Pumping Station and Deptford Church Street to Greenwich Pumping Station, from where it will be bored. This map shows the route of the tunnel. It would appear that the tunnel is being dug in a single go from Greenwich to the Thames, with most of the route deep under the Greenwich Rail Line. This Google Earth image shows the rail line between Greenwich and Deptford station. 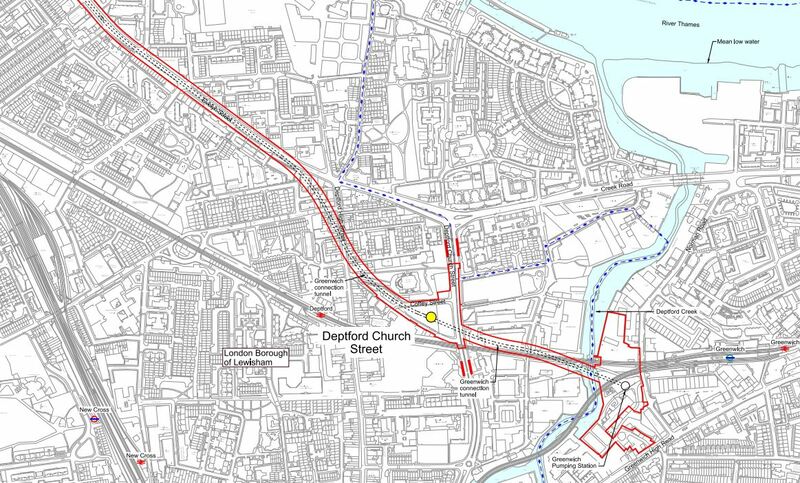 The works on Deptford Church Street are just to the north side of the rail line in part of the green space and those at the Greenwich Pumping Station are to the south of the junction, where the DLR branches south from the rail line. The next site at Earl Pumping Station is just off the main map at the left. On the page for the Greenwich Pumping Sration, Thames Water say this. In our application for development consent this site is used to drive the Greenwich connection tunnel, a long connection tunnel which connects the combined sewer overflows (CSOs) at Greenwich Pumping Station, Deptford Church Street and Earl Pumping Station to the main tunnel at Chambers Wharf. So it looks like Thames Water are sneaking the tunnel into Chambers Wharf. I doubt they’ll be much disruption from the actual boring of the Greenwich Interconnection Tunnel, as it’ll all be dug from Greenwich from a site with water access. As the tunnel is being bored towards Chambers Wharf, it would seem likely that the large amount of tunnel spoil created will be loaded on barges at Greenwich and taken away for disposal, with little disruption to anybody. It would appear to be a smaller version of the system Crossrail used on the Limmo Peninsular in East London.